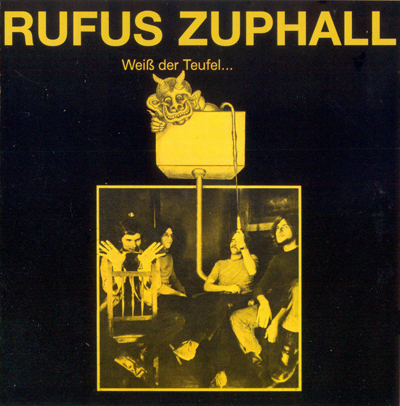 Debuting at the "Pop & Jazz Festival" in Bilzen in Autumn 1969, Rufus Zuphall (from the Northern German town of Aachen, next to the Dutch border) had a lot of influences at play in their music: Teutonic folk, Dutch psychedelia, a notable nod to Jethro Tull with much flute and dynamics, and a great deal of innovation of their own. Their self-produced debut WEIß DER TEUFEL... is considered one of the underground classics of the Krautrock era, a mostly instrumental, live and vibrant excursion full of raw energy and riddled with surprises, not least the side-long excursion based on the song "Summertime". PHALLOBST saw Rufus Zuphall succumbing a little to Rolf-Ulrich Kaiser's whim to turn Pilz into a folk label, and features an excellent version of the folk standard "Portland Town". Most of the album, however, comprises of some rivetingly complex progressive numbers, many of which feature extraordinarily processed flute, enhanced with fuzz and ring-modulation, all in a fiery rock-fusion of high flying rhythmic invention, that does everything it can to stagger the senses. The AVALON AND ON box set is a posthumous release comprising of PHALLOBST, an LP of archive recordings (including demos for an aborted third LP), and two LP's documenting their concert in Aachen (17 June 1972) from their farewell tour, plus a single by Günter Krause. It adds up to a remarkable testament to a highly creative and original band. After this the band disintegrated, and split up. Udo Dahmen did session work for a while, and filled in at the drum stool on Kraan's FLYDAY in 1978. all the others seemed to retire from the scene. Due to a resurgence in interest, because of the reissues, the band recently reformed, playing at festivals and recording a new album. However, the only album to surface so far is recorded live at Woodstöckchen Open Air Gessenich and other venues in 2000, it features old classics and new material, and includes a 17 minute version of "Weiss Der Teufel".